Melva Dorothy Longbottom was born on 8 December 1903 in Jamestown, South Australia , daughter of Frank Longbottom and Mary Edith Haines. David George Longbottom was born on 30 November 1904 in Jamestown, South Australia , son of Frank Longbottom and Mary Edith Haines. On 5 April 1932, David, aged 27, married Audrey Agnes Maple, aged 21, daughter of Horace Stephen Maple and Annie Caroline George, in Methodist Church in Brighton, South Australia . The marriage was celebrated at the Brighton Methodist Church of the Rev. David George Longbottom, eldest son of Mr. and Mrs. Frank Longbottom, of Brae-foot Estate, Kooringa, to Audrey Agnes Maple, eldest daughter of Mr. and Mrs. H. S. Maple, Edward Street, Brighton. The ceremony was performed by the Rev. G. K. Haslam. The bride, who was given away by her father, wore ivory satin with a beautiful embroidered tulle veil, which formed the train. She carried a sheaf of white gladioli. Misses Jean George, cousin of the bride, and Mary Longbottom, sister of the bride groom, were frocked in apple green crepe satin with large green felt picture hats edged with tulle, and had shoes to match. They carried sheafs in buttercup tonings of gladioli and dahlias. Little Patsie Davis looked charming in buttercup crepe satin, early Victorian style. She carried a basket of roses, and walked ahead of the bride strewing rose petals. The bridegroom was attended by his brother, Mr. E. Longbottom, and the bride's brother, Mr. M. Maple, as groomsman. When the register was being signed Miss M. Barnard, cousin of the bride, sang. As the bride was leaving the church a horseshoe was hung on her arm by her sister Ellison. The bride's mother was smartly gowned in black crepe satin, with hat to match, and carried a posy of red carnations. The bridegroom's mother chose navy marocain, with hat to tone. She carried a posy of autumn tints. The church was decorated by friends of the bride. The choir girls, dressed in white, formed a guard as the bride stepped from her car. At the rececent circuit farewell to the Rev and Mrs. D. G. Longbottom and daughter, Joan, the Woodside In stitute hall was packed to the doors. The ladies arranged beautiful floral decorations and the junior circuit steward, Mr. L. Polkinghorne, presided and welcomed the large number of friends present. 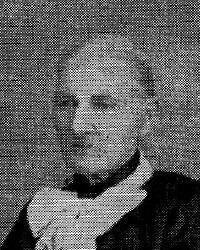 The speakers, who all referred in glowing terms to the fine work done by the Longbottom family throughout the circuit, were Mr. W. T. Gale (for Woodside), Mr. T. Smee (Charleston) Mr. W. W. Millar (Balhannah), Mrs. Gooding (Balhannah Ladies' Guild), Mr. Rowley (Lenswood), Mrs. Rowley (Lenswood Ladies' Guild), Mr. G. Schwab (Murdock Hill), and Mr. H. B. Pitt on behalf of the circuit. The speeches were interspersed with musical items consisting of piano overture, Mrs. Gun and Miss Janet Newman (Charleston); vocal solos, Mr. Cliff Green and Miss Minyon Green ((Lenswood) and Mrs. C. Dohnt, and piano solo by Mrs. Textor (both of Woodside), and a bracket of three numbers by Woodside Ladies' Choir. Frances Edith Longbottom was born on 8 November 1905 in Jamestown, South Australia , daughter of Frank Longbottom and Mary Edith Haines. Mary Haines was born in 1835 in Wiltshire, England , daughter of James Haines and Hannah Flower. She was christened on 20 December 1835 in Poulshot, Wiltshire, England . She died on Monday, 29 October 1917, aged 81 years, 10 months and 9 days, in Nhill, Victoria, Australia . Henry Haines was born on 27 October 1839 in Devizes, Wiltshire, England , son of James Haines and Hannah Flower. He died on Wednesday, 1 November 1905, aged 66 years and 5 days, in Gerang Gerung, Victoria, Australia . She was christened on 13 February 1842 in Poulshot, Wiltshire, England . STAKER - HAINES - On the 1st. January, at the residence of the bridegrooms father, by the Rev. W. Oldham, Mr William Richard Staker, second son of Mr. Francis Staker, Spring Farm, Allen's Creek, to Ruth, third daughter of Mr. James Haines, Allen's Creek. She was christened on 21 June 1846 in Poulshot, Wiltshire, England . She died on Tuesday, 19 February 1850, aged 3 years, 7 months and 29 days, at sea, on the "Trafalgar" and was buried at sea. 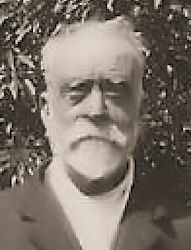 James Haines was born on 9 August 1851, son of James Haines and Hannah Flower. 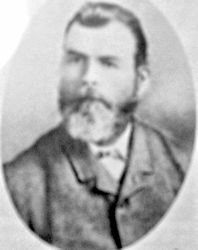 On 29 July 1879 he purchased land under the South Australian scheme known as the "Strangeways Act", where settlers could purchase land on credit, with 20% deposit and the balance payable at the end of 4 years.